Wednesday night we’re having dinner at our downstairs neighbors’ apartment (have I mentioned how much I love our building?) and I offered to bring dessert. I have a habit of baking chocolate desserts, partly because Matt and I are both chocoholics and partly because I have several absurdly easy and insanely delicious chocolate dessert recipes in my repertoire. And yet, I feel very strongly that summer desserts should be fruit-based; it just seems seasonally appropriate. All summer long in Maine, my mother made fruit pies with whatever berry was in season: strawberry rhubarb pie, blueberry pie, and (if we were really ambitious and went out to pick wild berries) tri-berry pie. I know mom’s pie crust recipe by heart, but I could never match a Janice pie. They are magazine cover pies and I just don’t have her magic touch or the patience to acquire it, so I am making a plum crunch instead. The best part about the plum crunch is that it calls for Crème de Cassis, which I picked up at the corner liquor store on my way home. Like fruit desserts, Crème de Cassis reminds me of my mother because she used to drink Kir Royales as a pre-dinner cocktail when we went out to nice restaurants. It also reminds me of my dad’s sister, Elaine, who likes to pour Crème de Cassis over vanilla ice cream or fruit sorbets for dessert. And of our honeymoon, when Matt and I stayed in a perfect chateaux in the Loire valley and drank Kir or Kir Peche on the massive stone balcony overlooking the estate’s old hunting grounds and the rolling hills of the French countryside. So obviously, I needed to make myself a Kir while I pitted and sliced three pounds of plums for the crunch. 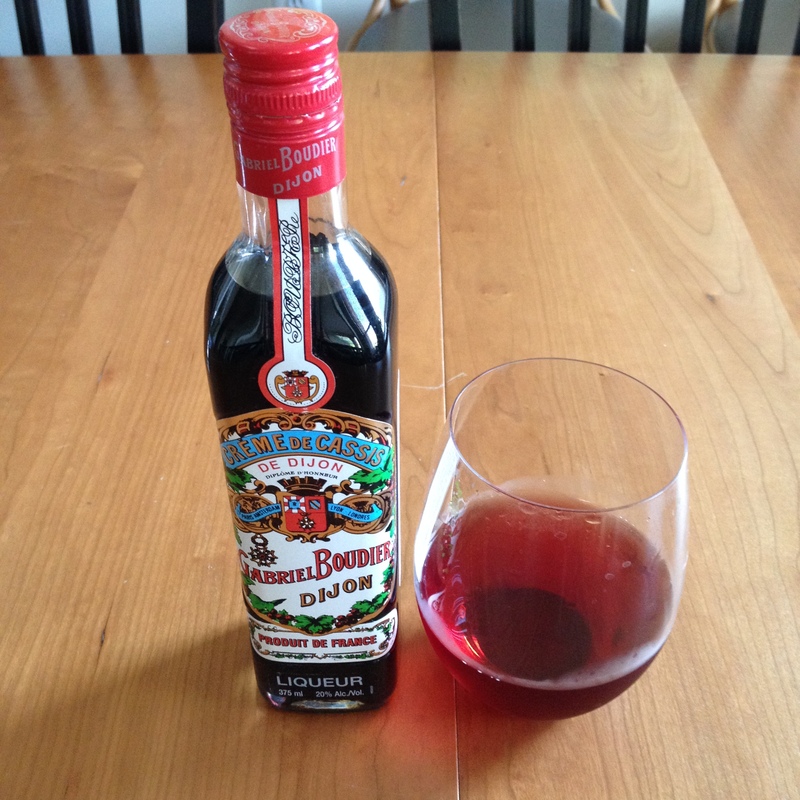 The Kir was delicious, but presented some mild challenges while preparing dinner. 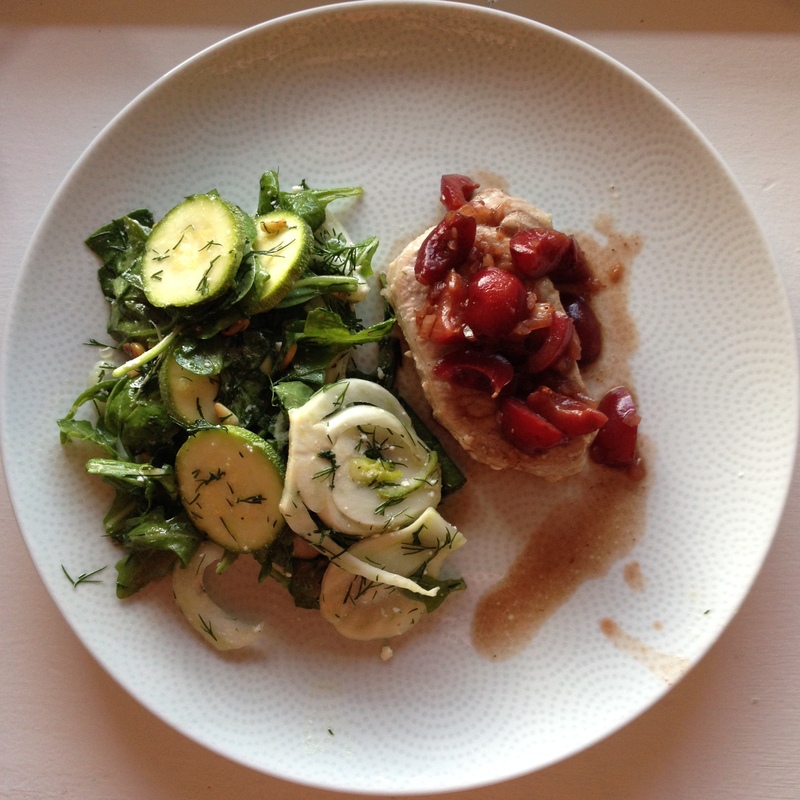 I decided to make one of my favorite weeknight standbys, pork loin with a shallot and dried cherry sauce, but because I was feeling bold, I used fresh cherries instead. This meant additional pitting and slicing, but it was worth it. I also made a new salad with finely sliced zucchini and fennel, fresh dill, arugula, feta, and toasted pine nuts. Unfortunately, paper thin vegetables require a mandolin, one of those kitchen tools that I loathe and adore simultaneously. I remember my dad’s run-ins with his mandolin, a beautiful all-metal version with a dial to adjust the width of the slices. I remember him fighting with the dial, getting flustered when the food caught on the blade, making an excessive amount of clanging metal-on-metal noises, and cursing repeatedly (per usual) until finally, finally, everything aligned perfectly and thin slices of potato or onion or fennel emerged. My mandolin is cheap plastic with different inserts to adjust the thickness and I, in my Kir-induced state, started with an insert that produced zucchini coins twice as thick as I intended. If you haven’t noticed from my previous posts, I make mistakes, a lot of mistakes, all the time. I overcook meat on the grill, I undercook meat on the grill, I breeze through directions and skip major steps or essential ingredients. But I’ve become very comfortable with mistakes and imperfection, and sometimes I learn from them. Even Janice’s pies, despite their picture-perfect appearance, were often far too runny, a berry soup with crust floating on top, but they were beautiful and absolutely delicious. The thick zucchini slices worked out just fine in tonight’s salad, too, and hopefully, the plum crunch will be equally successful, unevenly sliced plums and all.